Starting at $23 per truck/month. 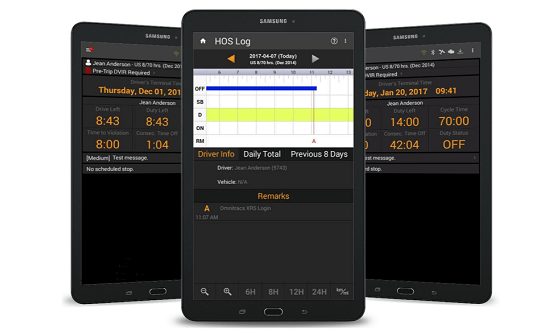 TransReport Services is making it easy for you to be compliant with the recently passed Hours of Service (HOS) legislation requiring all trucks traveling in the U.S. to have an Electronic Logging Device (ELD). Our partnership with Omnitracs, an industry leader in mobile technology for the transportation industry, keeps your fleet compliant while offering valuable insight into your driver's performance. The Omnitracs XRS platform delivers affordable enterprise grade fleet solutions to trucking companies of any size. The XRS system features best in class solutions for GPS tracking, HOS compliance and fleet optimization to smartphones, tablets or rugged handheld devices. Omnitracs XRS offers one of the easiest installations in the market. A single cable connection from the vehicle diagnostic port to the XRS Relay enables your Fleet Management Technology. Track driver’s hours and automatically record driver logs in near real time. Monitor your drivers, vehicles and sites all within XRS Fleetview web based application. Improve the safety and performance of your fleet by measuring and monitoring driver behavior with accurate, easy to understand data. The power of mobile becomes even more apparent outside the cab. Drivers can give detailed feedback while walking around the truck and trailer. Data plans with no contracts that include roaming in Canada and the U.S.
At TransReport Services we realize that there isn't a one size fits all solution for North American trucking fleets. That is why there are numerous packages to fit your unique needs. Simply looking to comply with the ELD mandate? We have a solution for you.